The Cendence remote controller is a professional-grade, customizable remote controller designed for full integration with other advanced DJI products like the Inspire 2 and CrystalSky monitor. Cendence offers modular components and controls that realize the full potential of Inspire 2 applications. It provides up to five analog control channels with over ten customizable buttons, improving overall control efficiency. Its design offers antenna interchangeability where a high-gain antenna can augment the power of DJI Lightbridge technology, significantly increasing overall anti-interference and image quality. Cendence comes with the fully integrated Cendence Monitor Mounting Bracket and HDMI, SDI, USB, and CAN ports provide robust expansion capabilities. The two knobs on the front panel control gimbal pitch and yaw, and the right/left levers and Focus Adjustment Knob used to tune flight controller settings and the gimbal camera in real-time, allowing you to pull focus and set aperture. Customizable buttons can quickly enable or disable frequently used functions like focus peaking, color waveform, obstacle avoidance, and home point resetting. They can also close warnings and tips mid-flight, all without using an app. Rotate the dials or toggle the right/left levers while holding certain buttons to control gimbal roll, shutter speed, or ISO. The CrystalSky monitor mounts to the Cendence remote controller via the Cendence Monitor Mounting Bracket.The Cendence remote controller’s antennas, PCB, mounting bracket, and battery are all detachable, making its hardware easily upgradable, allowing you to customize the controller for compatibility with future DJI aircraft. 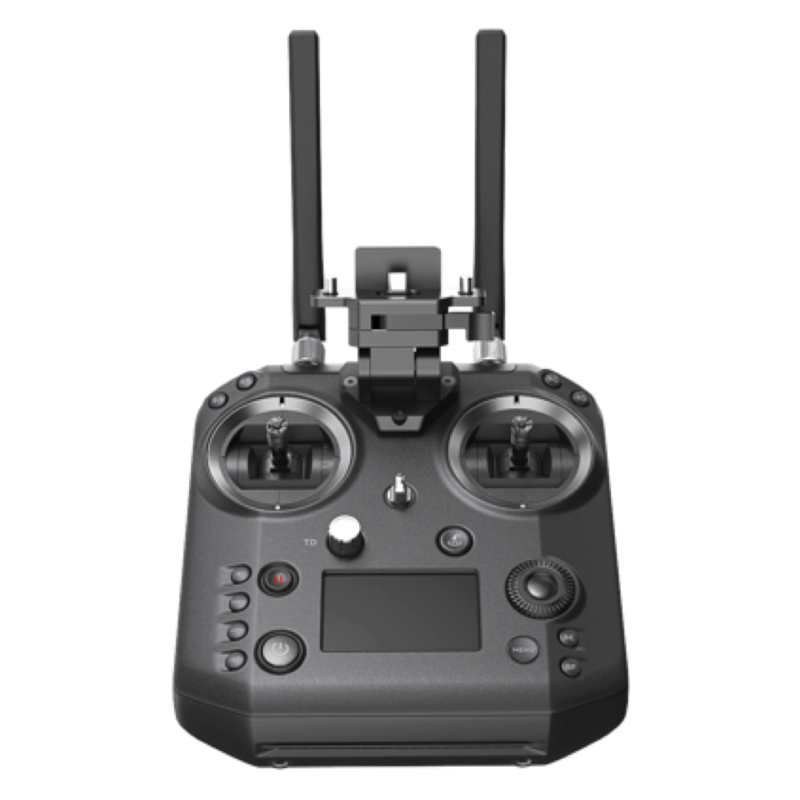 When precision camera control is required, Cendence can connect either as a Master or Slave controller with the Inspire 2’s remote controller or another Cendence remote controller. 1. SDI and HDMI ports support broadcasting at 1080i 50 fps and 720p 60 fps. 2. Connect DJI Focus, or other compatible accessories via the CAN port. Moreover, the antenna transmits signal in a specific direction, which effectively reduces interference from other directions and makes transmission even more stable and reliable. * When unobstructed, free of interference, FCC compliant, and antenna is pointed towards the aircraft. The Cendence remote controller uses a detachable battery that operates for up to four hours. If you run out of power, just swap in a charged battery or charge Cendence via the power port. Cendence uses the same batteries as CrystalSky monitor for enhanced product synergy. Practical accessories make using Cendence easy.The Cendence Support Rig handles part of the controller’s weight, making it easier to hold for extended periods of time.Control Stick Covers prevent dirt and dust from entering both sticks, ensuring smooth and reliable control.The Interchangeable Mobile Device Holder lets you attach a phone or tablet instead of a CrystalSky monitor. Cendence is currently compatible with Inspire 2 and Matrice 200 series aircraft.